"They don't bomb embassies and behead journalists," Levant said. This seems like a highly irresponsible statement to me because this implies all Muslims reacted in this manner and he made no comment of the originally peaceful protests such as pulling goods off the shelf. "Don't tell me the CBC respects religion. It's afraid of one religion." This is equally appalling, as if to say people need to fear Islam as a religion. "We're running them because they're the central fact that caused radical Muslims around the world to riot." If he knew it was giving power and rise to extremists why did he decide to publish these hateful cartoons? This seems like an attempt to incite hate. The bottom line is that this same editor said in 2003 that we would fight anti-Christian bigotry but when it comes to Islam he's doing is best to promote it and incite hate and fear against Muslims. The publisher of an Alberta-based political magazine is defending his decision to publish controversial cartoons of the Prophet Muhammad, saying Western media have been cowed into fear. Ezra Levant of the Western Standard magazine. 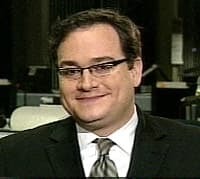 Ezra Levant of the Western Standard told CBC Newsworld that he published the dozen cartoons in Monday's edition because they are "the central fact in the largest news story of the month. "I'm doing something completely normal. I'm publishing the centre of a controversy. That's what news magazines do." The cartoons, published in September in Denmark and reprinted in other European papers in recent weeks, have outraged the Muslim world, setting off protests and boycotts of Danish products in several countries. Islamic tradition prohibits any depiction of the Prophet, even a respectful one, on the grounds that it could promote idolatry. The caricatures include a drawing of Muhammad wearing a headdress shaped like a bomb. Another shows him saying that paradise was running short of virgins for suicide bombers. Most media in Canada and the United States have refused to publish the cartoons. But Levant dismissed the notion that the decision is based on respect for Islam, saying the real reason is "out of fear." He said news organizations are more than willing to publish items that Christians find offensive because Christians only react by writing a letter to the editor. The Western Standard has a circulation of 40,000 and publishes every two weeks. Levant, who described the cartoons as "innocuous," said he would run cartoons about the Holocaust if Jews were burning embassies in response. "We're not publishing them for their editorial merits. They're boring cartoons, they're bland. We're not running them because we share their views. Mohamed Elmasry, leader of the Canadian Islamic Congress, told the Globe and Mail that his organization will seek to have charges laid against the magazine under Canada's laws against distributing hate literature. "It's unfortunate," said Elmasry, who had urged Levant not to republish the images. "I think he really goes against the will and the values of Canadians by this provocative action."